Download GTA 5 Smuggler's Run: is it possible? GTA 5 Smuggler's Run: can I download it? No, we can’t download GTA 5 Smuggler’s Run since it’s an expansion for Grand Theft Auto Online. In other words, it’s a version of the game that’s play online, therefore, it’s not like the rest of the games in this series that requires us download the main title. Nevertheless, that doesn’t mean that we don’t need to install a series of files to be able to play this expansion on our computer but, in any case, we’re not talking about an EXE file like in the rest of games. The main plot of this expansion is smuggling, specifically aerial smuggling. 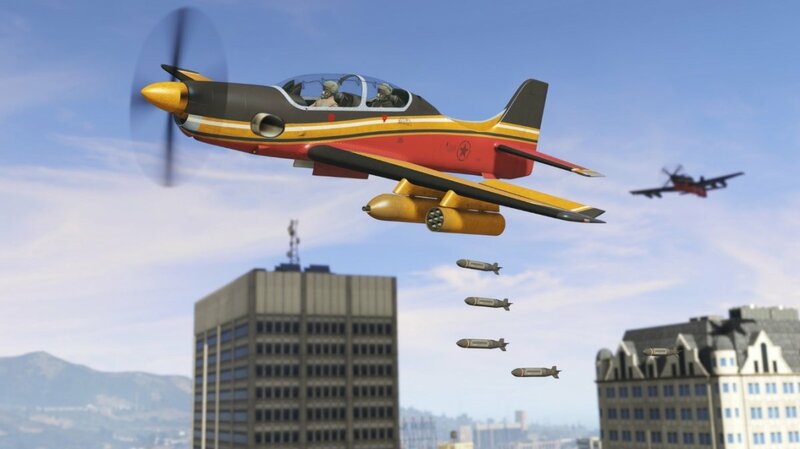 That’s why we’ll have access to hangars where we can board fully customizable planes that we can use to complete our missions that are basically all about transporting illegal goods all over the state. This game is obviously not about running a few errands as we’ll also have to try to run down our competitors and rival gangs that will also try to wipe us out. We can make use of all sorts of airplanes, including classic fighters, bombers from the Cold War, and helicopters. We can keep them in our private hangar and customize them with different aesthetic details, as well as being able to improve their engines and maneuverability. This expansion also offers the so-called rival mode that reminds us of the system on which so many action-packed battle royale games, of the likes of PUBG or Fortnite, are based. Here, four teams will have to fight against each other on a map that gets smaller and smaller as time goes by making it impossible to avoid each other. What is GTA 5 (Grand Theft Auto V)?